WHAT ARE OMEGAS AND WHY DO YOU NEED THEM? Everybody is unique but we all need omega fatty acids throughout life. The omegas, also known as essential fatty acids (EFAs), are ‘healthy fats’ required by your body every day for proper cell function as well as overall development, growth and health. Your body cannot make omegas, so it’s essential that you obtain them from your diet. We rely on two main sources: plants and cold-water fish. Modern lifestyle and eating habits, however, often result in deficiencies and imbalances, which can impair health, create inflammation, and contribute to chronic disease. Supplementing your diet with omega-rich oils is an effective way to ensure that you get the right amount of EFAs daily to prevent or improve poor health. 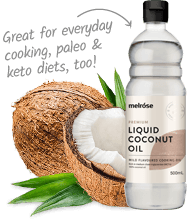 Whatever your dietary preference, health focus or stage of life, Melrose Pure Omegas make it easy to find the right sources of essential fats for you and your family. An unfortunate characteristic of the modern Western diet is that it often invites an over-consumption of omega-6. For many of us, our ratio of omega 3:6 is closer to 1:20 – 1:10 rather than the desired ratio of 1:1. High levels of omega-6 in the body may create an inflammatory environment making it more susceptible to disease. Excessive omega-6 may block the pathways for plant-derived omega-3 ALA to convert into EPA and DHA. To promote good health outcomes, we ideally want to establish and maintain at least a 1:4 ratio of omega-3 and omega-6. Supplementing with Melrose Pure Omegas alongside a healthy diet is a sustainable way to balance omegas. Our ambassador Steph Lowe discusses the reasons behind the imbalance in our omega intake, and how to improve this balance in her article Omega-3 and omega-6 fats: the balance. There are two groups of EFAs that you need to eat in the right balance. The first is omega-3 fatty acid alpha-linolenic acid (ALA) and its derivatives, eicosapentaenoic acid (EPA) and docosahexaenoic acid (DHA). The richest sources of omega-3s include flaxseeds (ALA) and cold-water fish (EPA and DHA). The second group of EFAs are omega-6 fatty acid linoleic acid (LA), and its derivatives, gamma-linolenic acid (GLA) and arachidonic acid (AA). The healthiest sources of omega-6s are cold-pressed seed oils, such as evening primrose, hemp and sacha inchi. Pure Ocean Omegas, such as Omega Fish Oil, are a brilliant source of omega-3 EPA and DHA. These omega-3 derivatives are easily absorbed and ‘ready to go’. As the richest source of readily bioavailable EPA and DHA, fish oil is the ideal way to consume omega-3 fatty acids. Supplementing with fish oil has been extensively researched in relation to many common diseases, and is shown to have a powerful anti-inflammatory impact. Our resident clinical nutritionist Cliff Harvey discusses omega-3 supplementation in his article Why you should supplement with fish oil. Pure Plant Omegas provide a rich source of omega-3 ALA, which requires the body to convert it to EPA and DHA (the ‘work-horses’). Conversion of ALA into EPA and DHA can be low, which means the intake of plant sourced EFAs may need to be higher for the desired outcome. It is, however, quite attainable for those with a vegetarian or vegan diet or an intolerance to fish to consume adequate omega-3. Good health starts with daily nutrition, but it shouldn’t cost you the earth. Melrose Pure Omegas is an ethically-sourced range of accessible premium health oils designed for everyday use. 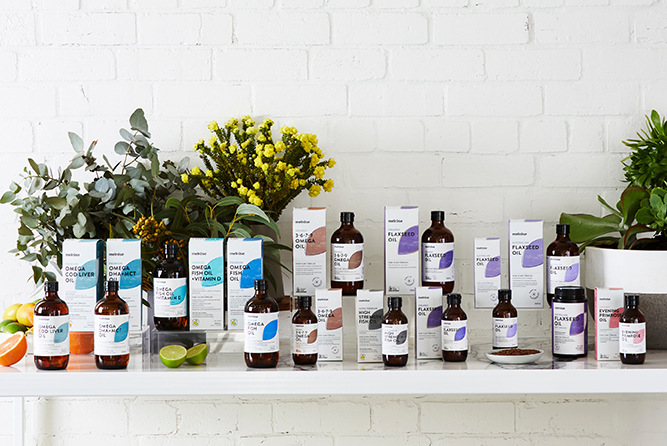 The range is based on decades of expertise sourcing and bottling oils, Melrose being the first to introduce flaxseed oil to increasingly health-conscious Australians in 1984. From source to bottle, we apply rigorous selection, processing and third-party testing criteria to ensure the finest raw ingredients, sustainability, nutrition and purity. The result is oils rich in essential omega-3s ALA (Pure Plant Omegas), and DHA and EPA (Pure Ocean Omegas). Melrose’s trademark packaging also helps protect the delicate fatty acids from spoilage due to exposure to oxygen and light. With all of the legwork done, you only need to pick them up online or in-store. There is an oil for everybody, meeting your health needs at any stage of life. Read on for more information about the ocean-derived and plant-based omegas. Melrose Pure Ocean Omegas are made with premium quality small cold-water fish sustainably caught from the cleanest waters. Our Ocean Omegas are purified using patented processes to provide clean, odourless oils whilst maintaining their natural integrity and therapeutic quality. Rigorous third-party testing ensures that our fish oils are low in toxic heavy metals and oxidation parameters but high in beneficial EPA and DHA. Recent controversy in the media has many concerned about the validity of fish oil supplementation. The concern is real. A recent study in New Zealand identified that many fish oil supplements in the market exceeded recommended amounts of oxidative markers, with some also containing less EPA and DHA than stated on the label. This highlights the importance of using fish oils from a trusted company with only very high quality, sustainably-sourced, and rigorously-tested fish oils. Our High Strength Fish Oil, for example, is derived from 100% sustainable wild-caught anchovies from the South Pacific and is extracted within close proximity to the fishing source to guarantee low oxidation. 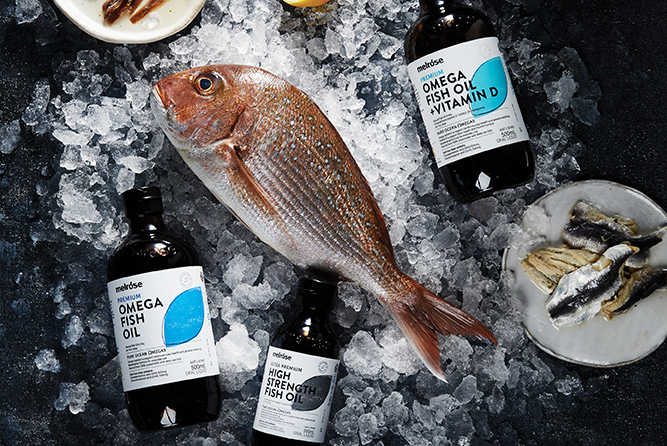 All Melrose fish oils are processed in accordance with the strictest industry standards for safety and efficacy, which include GMP, HACCP and GOED certifications, and are bottled in our TGA-approved manufacturing facility in Melbourne, Australia. Ocean Omegas may be effective in reducing pain associated with chronic inflammation, reducing the risk of cardiovascular disease, supporting the immune system, and optimising bone, eye, and brain health. We love our newly developed Omega DHA + MCT Oil for brain health. DHA makes up around 40% of fatty acid in the brain and deficiency has been linked to Alzheimer’s disease and dementia. DHA may be helpful in enhancing memory, mental performance and cognition. MCT oil provides direct energy to the brain and can assist in improving mental clarity and performance. The combination of these two powerful ingredients provides a fantastic product for optimal brain health. Our resident clinical nutritionist Cliff Harvey provides more detail on the benefits of this unique product in his article, Why fish oil and MCTs? Lightly flavoured with natural flavours, Melrose Pure Ocean Omegas are palatable enough to be taken straight off the spoon or can be added to juice or water. 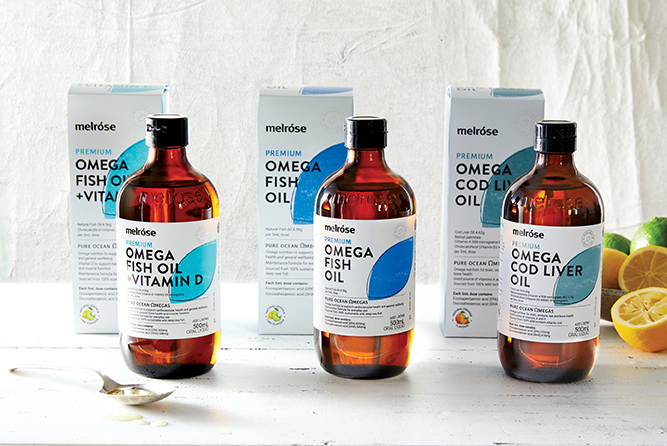 Melrose Pure Ocean Omegas range includes Omega Fish Oil, High Strength Fish Oil, Omega Cod Liver Oil, Omega DHA + MCT Oil and Omega Fish Oil + Vitamin D.
Melrose Flaxseed Oil boasts one of the highest plant sources of omega-3 ALA available. We select quality raw ingredients, locally grown and organic wherever possible, which are cold-pressed to create pure, clean oils and preserve their important nutritional benefits. At Melrose we believe everyone deserves good health, so we developed a range of plant-based omegas incorporating a variety of oils to ensure the omega intake for vegetarians and vegans can be well balanced. We love our new Organic 3-6-7-9 Omega Oil, a delightful blend of flaxseed, macadamia, hemp, avocado and sacha inchi oils, which has been created to provide a rich source of important omegas for anyone who enjoys plant foods. The fresh, nutty taste of Melrose Pure Plant Omegas mean they are easily included in your diet and can be enjoyed straight from the spoon or included in smoothies, food or even as a base for salad dressings. We have provided a variety of recipe ideas to help you to incorporate more of these beneficial omegas in your diet. Melrose Pure Plant Omegas range includes Organic Flaxseed Oil, Australian Flaxseed Oil, Australian Flaxseed Oil Caps, Organic 3-6-7-9 Omega Oil, and Organic Evening Primrose Oil. There are three main things to consider when choosing the right Pure Omega for you: stage of life, desired health outcome and dietary preference. Our easy to follow Pure Omegas Health Focus Chart illustrates which oils may be best suited to your individual needs. From pre-conception through to the elderly, at Melrose, we have a Pure Omega to meet your needs. Omega Fish Oil is a good choice for pregnant women, infants and children. Whereas, Omega Cod Liver Oil and Omega Fish Oil + Vitamin D may be more suited to health requirements of the elderly. The anti-inflammatory effect of omega-3 may contribute to reduced pain, reduced risk in cardiovascular and autoimmune diseases, and reduced symptoms associated with skin conditions such as eczema and psoriasis. Omega Fish Oil and High Strength Fish Oil are great options for addressing these concerns. Omega-3 is vital to optimal brain health, from foetal and infant brain development to reducing risk of degenerative conditions such as Alzheimer’s and everything in between. An apt choice for improving mental stamina and performance in adults is Omega DHA + MCT Oil. For general wellbeing and balancing omegas, Organic Flaxseed Oil varieties or Omega Fish Oil are simple and effective. At Melrose we want to make sure everybody has access to quality health products. Our Pure Plant Omegas provide an excellent omega-3 alternative for vegetarians and vegans. Please refer to our Pure Omegas Health Focus Chart for more assistance in choosing the right oil for you. Melrose High Strength Fish Oil is derived from 100% sustainable wild anchovies from the South Pacific. The patented purification process and independent lab testing for heavy metals and environmental toxins ensures only the purest quality premium fish oil. Extracted within close proximity to the fishing source ensures low oxidation and a clean sensory profile, resulting in a pleasant taste and smell. Melrose High Strength Fish Oil is a concentrated source of essential omega-3 fatty acids eicosapentaenoic acid (EPA) and docosahexaenoic acid (DHA). Melrose Omega Fish Oil is derived from 100% sustainable wild-caught sardines and anchovies. The fish used in the production of our oils are caught by purse seiners, which have no impact on the seabed. Melrose Omega Fish Oil is a good source of essential omega-3 fatty acids EPA (eicosapentaenoic acid) and DHA (docosahexaenoic acid), which cannot be produced by the body and must be obtained through the diet. Independent lab testing for heavy metals and environmental toxins ensures only the purest, quality premium fish oil. 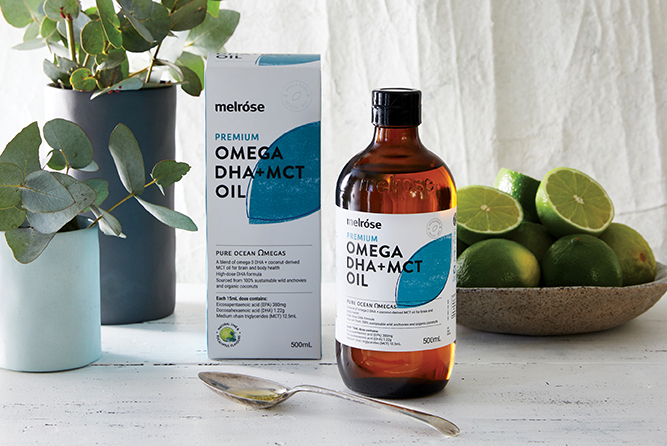 Melrose Omega DHA + MCT Oil is a blend of high-concentrate DHA fish oil derived from 100% sustainable wild-caught anchovies and sustainable coconut-derived MCTs (medium chain triglycerides). Melrose Omega DHA + MCT Oil is formulated with the ideal ratio for brain health. Docosahexaenoic acid (DHA) is a primary component of every cell in the body. It is the most abundant omega-3 found in the brain and eyes and is important for cell function. Coconut-derived MCTs are easily absorbed and converted in the liver to ketones, which are used for energy by the body and brain. MCTs are not stored in the body as fat. Melrose Omega Fish Oil + Vitamin D is derived from 100% sustainable wild-caught sardines and anchovies. The fish used in the production of our oils are caught by purse seiners, which have no impact on the seabed. Melrose Omega Fish Oil + Vitamin D is a good source of essential omega-3 fatty acids EPA (eicosapentaenoic acid) and DHA (docosahexaenoic acid), which cannot be produced by the body and must be obtained from the diet. Essential fatty acids and vitamin D are common nutritional deficiencies. Vitamin D is a fat-soluble vitamin, which makes the perfect combination with fish oil. Melrose Omega Cod Liver Oil is derived from wild Icelandic cod from the pristine waters of the northern Atlantic. Deep ocean fish such as cod are a natural source of the essential omega-3 fatty acids eicosapentaenoic acid (EPA) and docosahexaenoic acid (DHA), which cannot be produced in the body and must be obtained from the diet. Melrose Omega Cod Liver Oil contains a good source of vitamins A and D to support general health and wellbeing. Melrose Organic 3-6-7-9 Omega Oil is a premium blend of highly nutritious omega oils. Essential fatty acids are vital to life and health as they are the primary energy source for cells. Omega-3 and 6 cannot be produced by the body and must be obtained through the diet. Omega-3 needs to be consumed in higher amounts as it is known to be the most deficient in the modern diet. We have formulated this blend to contain the ratio of omega-3, 6, 7 and 9 to give you the perfect balance to achieve optimal health. Flaxseeds and sacha inchi seeds are natures richest sources of plant-derived omega-3. Hemp seed oil is rich in omega-6. Avocado and macadamia oil naturally contain omega-7 and 9. Melrose Organic Flaxseed Oil is cold-pressed from organically grown flaxseeds. Flaxseed oil has one of the highest concentrations of plant-based essential fatty acid omega-3 alpha-linolenic acid (ALA) and is an excellent vegan alternative to fish oil. ALA is converted to eicosapentaenoic acid (EPA) and docosahexaenoic acid (DHA) in the body, which are essential fatty acids that help support brain and cognitive health. Melrose was the first in flax, producing the first bottle of flaxseed oil for the Australian market over 30 years ago. 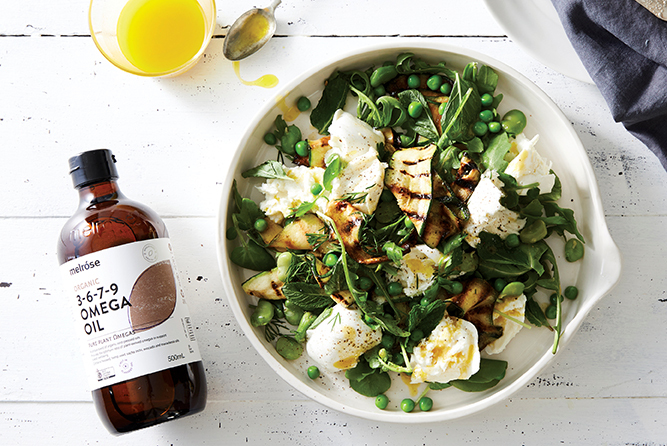 Melrose Flaxseed Oil is cold-pressed from Australian-grown flaxseeds. Flaxseed oil has one of the highest concentrations of plant-based essential fatty acid omega-3 alpha-linolenic acid (ALA) and is an excellent vegan alternative to fish oil. Flaxseed oil is a delicate oil that is sensitive to heat and light. To enable this product to be stored at room temperature and retain the nutritional profile, it undergoes a specialised fine-filtration process to remove any naturally occurring substances which can contribute to spoilage. Melrose Australian Flaxseed Oil Soft Capsules contain cold-pressed organically grown flaxseed oil. Flaxseed has one of the highest concentrations of plant-based essential fatty acid omega-3 alpha-linolenic acid (ALA) and is the ideal vegan alternative to fish oil. ALA can be converted to eicosapentaenoic acid (EPA) and docosahexaenoic acid (DHA) in the body, which are important essential fatty acids to help maintain general health and wellbeing. Melrose Australian Flaxseed Oil soft capsules help balance the omega-3 to omega-6 fatty acid ratio in the body. Melrose Organic Evening Primrose Oil is cold-pressed from the seeds of the evening primrose flower, which blooms only at sunset. Evening Primrose Oil is a rich source of gamma-linolenic acid (GLA); a unique omega-6 fatty acid that assists in the production of hormones necessary for many important bodily functions. Evening Primrose oil has been used traditionally to help with skin, scalp and hair health. It can be used topically to help nourish and moisturise the skin.